Here are three graphs, pulled from a talk I gave at UMTRI in the spring. The Japanese auto industry – that is, manufacturing and retail inside Japan – faces permanent decline. Second, the vehicle mix is unfavorable. 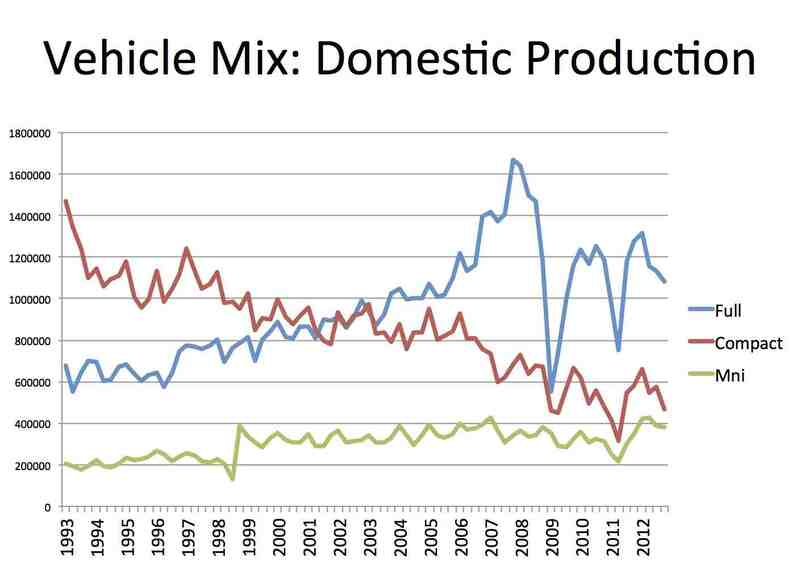 From the production standpoint, exports are important, but the data show that the market isn't increasing, has more low-value vehicles and is very volatile. The third graph is the domestic parc, which is what matters for dealers. 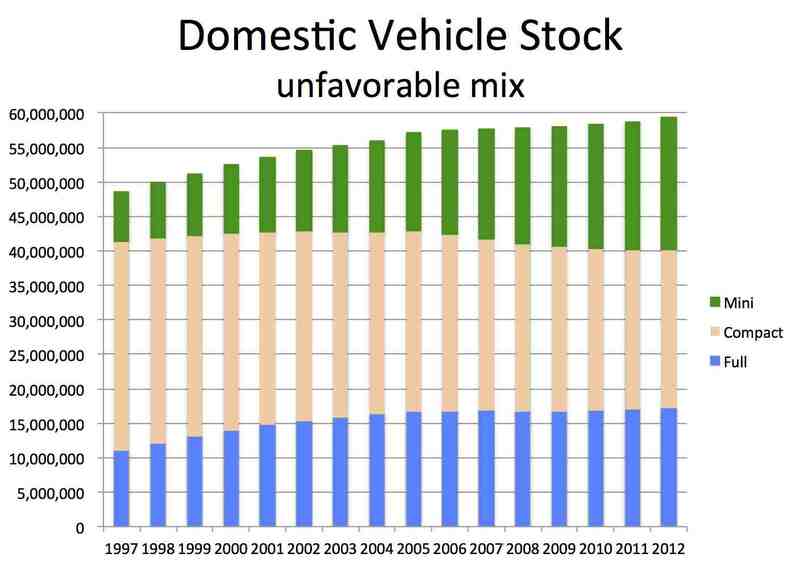 Here the story is even worse, while full-sized cars rose in share along with incomes, that process has ended. Instead what we see is a decline in mid-size car sales (compacts in the US context) and their replacement by "kei" minicars. Here are implications, as I see them. Over time dealers will face extraordinary pressure. 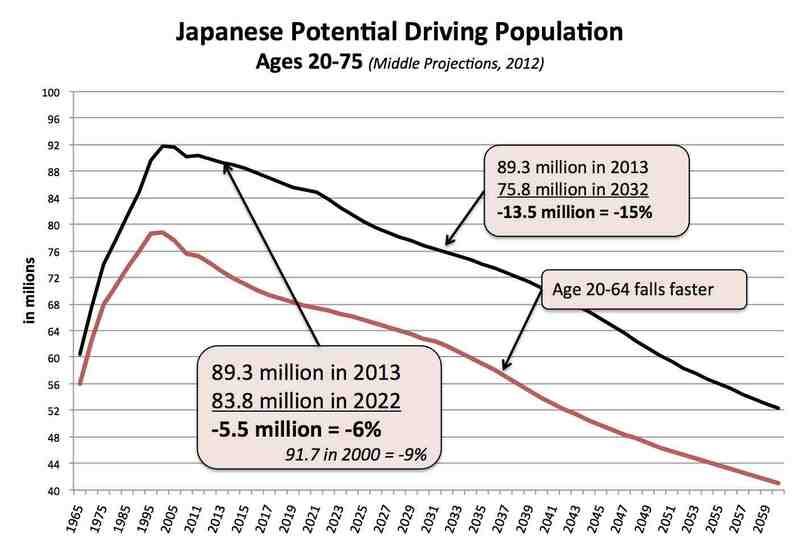 That will be accentuated by the geographic aspect of population decline, because population will fall more and age faster in rural areas where car ownership is highest. Rural areas are already distinctly older than the major urban areas (Tokyo-Yokohama-Kawasaki-Chiba, Osaka-Kyoto-Kobe, Nagoya, Hiroshima, Fukuoka-Kita Kyushu, and Sapporo). Their potential market is literally dying off. Dealerships in Japan are also unable to sell across prefectural boundaries, so better-run dealerships can't use the internet to extend their geographic market to offset local decline. Manufacturers will face a smaller market. They have a large number of distribution channels – not including trucks, Toyota has six channels: Daihatsu, Netz, Corolla, Toyopet, Toyota and Lexus, with lineups that overlap and cannibalize each other. (Dealerships are also multi-point, with sales points each trying to buy business from other parts of the same dealership, while the strong players in used cars are independents such as Gulliver.) Rationalizing production and model mix and distribution will be traumatic, as we've seen with the efforts of GM, Ford and Chrysler in dropping multiple brands. Suppliers will have an even harder time. Small Japanese suppliers were slow to internationalize. Even worse, when I've visited suppliers in Japan for engineering presentations – and in sharp contrast to similar visits in the US and France – I've been the only non-Japanese in the room. That hurts in two ways. First, there just aren't that many would-be engineers graduating from Japanese universities. Without international staff they simply won't be able to stay in the game. Honda and Toyota have huge engineering operations in the US that can handle the entire vehicle development process. As far as I can tell, that's not the case with most Japanese-headquartered suppliers. Second, in order to serve their customers on a global basis, suppliers need to have the same global capability. Some will finesse that by being acquired by foreign firms, and thereby globalize their engineering. Others will prove unable to build a global engineering and manufacturing presence because they've been slow to delegate decision-making and build capabilities and staffing outside Japan. They will steadily lose market share to firms with HQs outside Japan. Indeed, my scanning of industry news (in English, Japanese and [less frequently] German) supports that. Toyota is turning more and more to the big US/Europe based global suppliers, because their own "keiretsu" suppliers can't support Toyota's global footprint. Now this is a third bullet, but is speculative so I won't claim it as a 3rd point. My belief is that because of the two factors above Japanese suppliers lag in technology. Casual empiricism turns to the body of finalists in the Automotive News PACE competition, who are chosen on the basis of successful innovation. Japanese firms are largely absent. [Mea culpa: the competition is entering its 20th year, and I've been a judge since the start.] Not having a truly global mindset, not having the bulk of engineers in Japan able to use English as a working language, means that Japanese suppliers are behind the eight ball in technology. Sometimes it's better to be a bit behind where you can learn from other's mistakes and simply not invest spend money on "advanced concept" R&D that leads to dead ends, the "bleading edge" thing. OEMs also want second sources, so even firms that have reasonable intellectual property know they won't have a monopoly. Still, my judgement is that being second source is less profitable. And being second-source based on production in Japan is a losing proposition. Japan, as a geographic entity, is already a shrinking part of the global industry. Of course the growth of the BRICs and ASEAN means the same is true of the Euro zone and of NAFTA. My belief is that slow internationalization will accentuate the impact of a shrinking domestic market. That's particularly good new for non-"Japan" suppliers. In the 1980s the US industry feared that domestic firms would disappear under the onslaught of Japanese "keiretsu" suppliers. That's not what we see if we look at the top 100 suppliers today. Hey my friends I tell you something can you give me answer You need to listen for any types of noises coming from the wheels or axels. Have the car driven slowly toward you and slowly away from you. Watch the tires for wobble. This can mean a problem with the front end or rear end parts. It might also signal a bent wheel. If the car seems to lean or tilt to one side either from top to bottom or front to back, have the springs and suspension checked. Have any noises investigated. I think your article will give those people a good reminding. And they will express thanks to you later.Saffran International Co Ltd is a used vehicle exporter based in Tokyo-Japan, dedicated to being your source of quality Distributor of used Japanese vehicles. Thanks , you have provide some important information. These will be really helpful to me .Thanks to share this information.We are Tokyo based authorized exporter of used trucks Japan and used cars Japan provide excellent quality of used cars and used trucks to customer. Very interesting perspective here on the Japanese auto industry. Do you think we'll see similar things from the other Asian markets for car manufacturing? Thank you for sharing valuable information. Nice post. I enjoyed reading this post. The whole blog is very nice found some good stuff and good information here Thanks..Also visit my page auction license DLC Network offer all kind of dealer and brokers licensing solutions including auction license.